With his first game in the books, the Bryce Harper rookie card can now become a reality. Topps wasted no time revealing what could become the super prospect's first fully licensed MLB card. Topps previewed the mock-up during Harper's first game in Los Angeles. While Topps has yet to say exactly when Harper's first rookie cards will start showing up, the preview suggests 2012 Topps Series 2 Baseball is the likely scenario. The card maker announced on Twitter that they will make an official announcement within the next few days. Topps also has an autograph deal in place with Harper. Learn more about key Bryce Harper prospect and national team cards. "We are excited to see Bryce get called up. We are excited to be his exclusive autograph partner. We are excited for collectors and baseball fans," said Topps' Mark Sapir. "We, of course, will do our best to quickly capture Bryce's debut and quickly get him in our product as a big league rookie card for fans and collectors to enjoy." Harper's debut against the Dodgers in Los Angeles was filled with dramatics and memorable moments. The 19-year-old phenom hit a double in the seventh inning. The hit was somewhat upstaged by a fan caught mooning the camera behind home plate at the time of the pitch. In the ninth, Harper got his first MLB RBI with sacrifice fly that gave the Nationals a 2-1 lead. After the Nationals added a third run, the Dodgers sent the game to extra innings with two runs of their own. Harper was overshadowed once again when Matt Kemp hit a game-winning home run in the bottom of the tenth. Harper, the first overall pick in the 2010 MLB draft, has baseball cards in several sets. However there is still no official Bryce Harper rookie card. Between 2008 and 2010, Harper had several cards in USA Baseball sets and inserts. Several autographed versions are among these options. Topps made a bunch of Bryce Harper cards in 2011 that show him in a Nationals uniform, but they were only licensed by MLB. They were also technically inserts. However, these Bryce Harper cards have value and will continue to be in big demand as long as he remains hot in the hobby. Now with his first MLB game done, Topps is free to make Bryce Harper rookie cards approved by both MLB and the MLB Players Association. 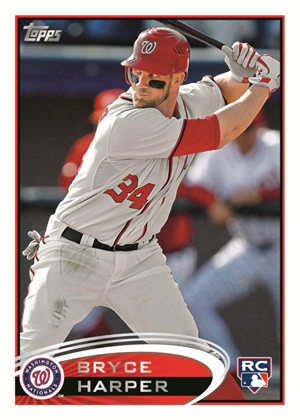 Panini will also be able to make Harper cards under their MLBPA license. With Harper, Yu Darvish and Yoenis Cespedes all making their debuts already this season, 2012 is turning into an extremely strong year for rookie cards. 2018 Topps Update BRYCE HARPER ASG Vintage Stock 99 Parallel US209 Nationals! !